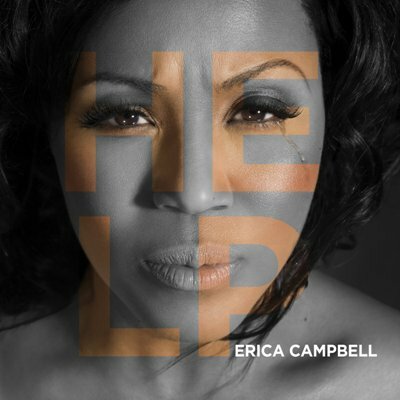 Erica Campbell | Help - TheUrbanMusicScene.com | Music Reviews! When fans catch wind a member of their beloved duet or group recording a solo project, their natural tendency is to rev up the rumor mill about a potential breakup. But the realities between the industry demands and the demands weighing upon one’s personal lives, even within a time-tested act, are constantly taken into account. Now facing this scenario are the sister duo of Mary Mary, Tina and Erica Atkins-Campbell. Their track record of electrifying the R&B and gospel radio airwaves since 2000 with five top-selling CD’s and number #1 singles, “Shackles (Praise You),” “Heaven,” and “Go Get It” is undoubtedly impressive. All the rumors aside, Tina and Erica are still one of the most respected contemporary gospel icons who have progressed artistically; weaving blues, jazz, R&B, hip-hop and pop without sacrificing their express purpose of praise and worship. Yet under a bigger social media microscope, thanks to Mary Mary’s current reality show, Erica decides to gracefully answer the questions for Tina’s personal hiatus. Despite reported whispers of a possible split, Erica is also unhesitant in stepping out sans Tina (though her sister is very active behind the scenes), bowing the summer of 2013 with “I Need A Little More Jesus,” which immediately registered with Mary Mary’s faithful listeners and earned a Grammy nomination for Best Gospel Song. Several months later, Erica is finally presenting her full-length debut under the My Block moniker, entitled Help. Though the Mary Mary energetic surges and meshing of other urban genres are in abundance and their producer Warryn Campbell’s fingerprints are evident, Erica’s vocal sufficiency still holds its own. “The Question” ushers in Help with a simplistic, minimal arrangement centering on Jesus’ sacrifice for all: “No man takes my life from me, but I lay it down voluntarily.” In the opposite direction, the thumping southern gospel praise (and a swinging harmonica to boot) surrounds “I Need A Little More Jesus.” Co-written by Tina, there is a mini reality check in the process: “I can’t fix you cuz I’m trying to fix me/I’m tryin’ to find help so I’m on my knees.” A bigger reality platform plays out on the title track (with an insightful assistance from rapper Lecrae) in the battle of balancing the pressures of the world and maintaining one’s faith. The slow grinding funky praise of “You Are” finds Erica acknowledging the greatness of God: “My schedule and my plans/The shows and the fans/Would probably drive me crazy/If I didn’t hold Your hand.” However, the Tommy Boy electro funk-driven “More Than a Lover” does not suit well for Erica as her vocals are buried in a sea of electronics. Despite a couple of aforementioned bumps, Help unquestionably establishes the initial phase of her already stellar career. Even if Help displays some of the Mary Mary stigma, Erica should have no issues building upon her own unique musical personality from this point on. Four and a half stars out of five.